It was a crazy start to the week, new things kept coming in by the minute and I noticed, with great annoyance, that responding to my e-mails constantly disturbed my workflow. Do you feel the same way sometimes? Then you are one of many. Studies show that e-mails are among the top ten productivity killers at work. I compiled tips that help you manage your e-mails more effectively. E-mail is the most common medium for communication in today’s business world. Despite the many well-working freemail and web-based options, Microsoft’s groupware Outlook ranks at the top of the most popular e-mail clients. 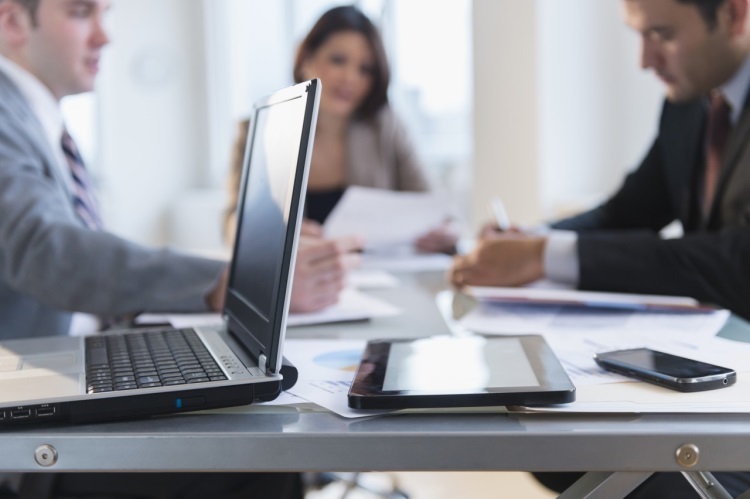 You can customize the standard software in a few steps to adjust it to your personal needs. This is how you can team up with your Outlook e-mail client to help you improve your time management. Include two dedicated e-mail time slots into your work day, ideally during a time when your productivity is at a low anyways. For most of us this would be directly before or after lunch break and about 15 to 30 minutes before the end of your work day. This way you don’t get constantly interrupted by e-mails but can respond to messages en bloc. If the message is really urgent, it makes sense to place a quick call. Whenever you have to work on your e-mails it is convenient if you don’t have to loose time searching for the program. Placing a shortcut on the task bar helps you find the program when you turn on the device. Right click on the Outlook Icon while you are running the program and click on Attach to Task Bar in the context menu that pops up. On average, an office worker receives about 100 e-mail messages a day, that’s 700 e-mails in only one week. If you keep them all in one single folder, you are bound to spend much time searching for one specific e-mail that you wanted to verify something on. It is helpful to create subfolders to your Outlook inbox and create folders for example to organize your e-mails according to topics or different projects you work on. To create a new folder, right click on the Inbox folder and select New Folder from the context menu. Enter a name for the new folder and you are good to go. You can even create sub-folders for the sub-folder. But don’t get lost creating a structure – in this case, less is more. It happens all the time: You receive a message, respond to it and a few days later there is some related information you want to add and you can’t find the e-mail for the follow up. Hunting down the message manually in one of the inbox folders and scrolling through the long list of e-mails is a time consuming process. Instead, use the Full Text Search in Outlook. Simply enter a search query into the search box and the software automatically analyzes the messages in your entire e-mail account for the search term. Press F3 to activate the Search Tool or simply enter your keyword into the search bar at the top of the e-mail list. The default setting of Microsoft Outlook includes an alert for incoming messages that pops up on the bottom right corner of your computer screen. Turn it off. Every alert that disturbs your thought process will cost you up to 30 minutes of your time even if you don’t send a response. In order to deactivate the alert, open the Microsoft Outlook Options on the File tab. On the Mail tab go to Message arrival and uncheck the control box next to Display a Desktop Alert. You can customize the quick access toolbar and add commands that you use frequently to best fit your communication needs. Every command that is included in the software is also available in the quick access toolbar. To edit the quick access toolbar click on the arrow on the right of the list and select the command you want to add from the drop down menu. For additional commands click on More Commands. With the Quick Step tool you can create shortcuts for custom commands that you use frequently. This helps you streamline multi-step processes and make them available at one single click. 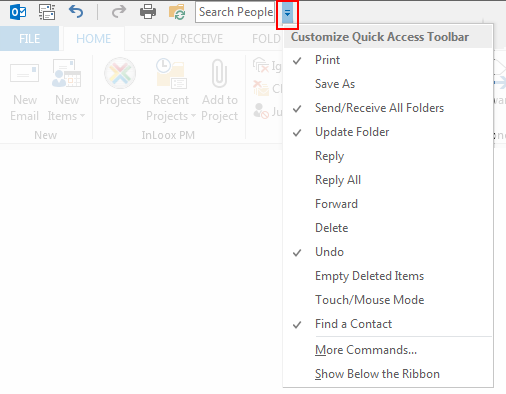 On the Outlook Home tab go to the Quick Steps group and click on the button with the down arrow. Click on New Quick Step to add a new command or click on Manage Quick Steps to edit an existing command. A Quick Step command could for example be an e-mail template that helps you optimize the communication with your team. 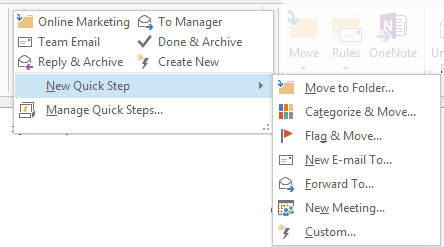 Follow the above mentioned steps to create a new Quick Step and from the drop down menu select New E-mail To… Enter a name for the Quick Step e-mail template and select the Outlook contacts you want to receive the team e-mail in the First Time Setup dialog box. Click on Options to enter more information like a standard subject line, importance status and text. You can also create a keyboard shortcut for even faster access. Instead of manually entering your signature at the end of every e-mail message you are composing, you can define a personal signature that will be added to every new message you create. To add a new signature, open a new message and click on the Signature button on the message ribbon. Enter your company signature include images and format the text to fit your CI and your e-mail correspondence looks professional at the click of a button. Check your e-mail contacts on a regular basis and update the contact information, delete redundant entries and those you no longer need. This saves time when going through the contact list to find one that you really want to reach. It is helpful to empty the message recycling bin from time to time. When you delete a message from your inbox and any of its subfolders, the e-mail is moved to the recycle bin that functions like an archive. You can go to it and restore any deleted/archived message. Emptying the recycle bin helps you erase unnecessary data that only slows down the software. In order to empty the recycle bin, right click on the folder Deleted Elements and select the option Empty Recycle Bin from the context menu. How to Manage Your E-Mails More Effectively - Part 1 - InLoox • Copyright 1999-2019 © InLoox, Inc. All rights reserved.